In 2015 BigCityBeats will once again transform the Commerzbank Arena into the ‘biggest club in the world’, running for three full days. On 5-7 June 2015 a gigantic ½-million-m² dance-floor complex will once again be assembled in the city of Frankfurt, Germany. 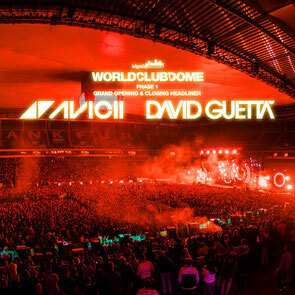 The first two artists booked to play at the 2015 World Club Dome festival, as opening and closing acts, were recently revealed as Avicii and David Guetta. The 25-year-old Swede, Avicii, will deliver the official opening set on the Friday evening and on the Sunday evening French DJ David Guetta will play the official closing set of the event. Guetta, who recently released his sixth studio album, ‘Listen’, has had chart success with singles such as ‘Dangerous’ and ‘Lovers On The Sun’. ‘Lovers…’ was No1 in Germany for seven weeks this summer. Avicii is also seeing success with new tracks ‘The Days’ and ‘Divine Sorrow’, (featuring Wyclef Jean), continuing the success he enjoyed with his No.1 album ‘True’.